The once-cheerful Christian Democrats may well be praying for salvation these days. With an average of just 3.5 percent of the vote in the latest public opinion polls, they still tip the balance in Parliament, and now their leader is forcing them to make an historic political choice. He’s not off to a good start. The party has been in a state of crisis since the Christian Democrats logged their worst election ever in last year’s national election. They only won 4.2 percent of the vote but the traditionally non-socialist centrist party wound up holding the powerful swing vote on contentious issues in Parliament. The pressure on them has been great, and now party leader Knut Arild Hareide not only wants party members to choose sides, he wants them to make an historic left turn and join the Labour Party-led opposition. 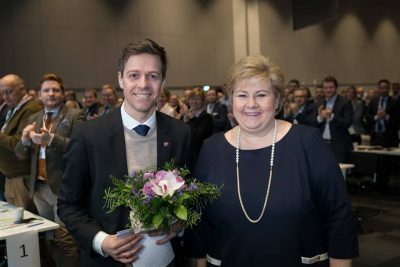 That could sooner or later topple Norway’s conservative government coalition that’s been led by Prime Minister Erna Solberg for the past five years. As commentators have noted for the past week, though, Hareide’s sudden drive to bring down the government may bring himself down as well. His first attempt at winning over party faithful in Agder, Southern Norway, failed Thursday night. A solid majority there voted against Hareide’s left-wing flirt and voted in favour of joining Solberg’s government instead. Some members even added to calls for Hareide’s resignation as party leader. Norwegian media have been full of stories every day for the past two weeks about the political drama that’s unfolding both inside and outside the Christian Democrats’ party. Hareide has a month, until an extraordinary meeting called for early November, to convince his party fellows that he has seen the light and the way. It won’t be easy. More than 70 percent of all Norwegian voters think the Christian Democrats (Kristelig Folkeparti, KrF) belong on the right, non-socialist side of Norwegian politics, according to a poll conducted by research firm Kantar TNS for TV2. Only 29 percent think they belong on the left, socialist side. The party’s own voters are even more emphatic: Fully 86.7 percent polled define the Christian Democrats as conservative, while only 13.3 percent think they’re “radical,” as defined by Hareide during Parliament’s opening debate this week. Jan Tore Sanner, deputy leader of the Conservative Party that’s been wooing the Christian Democrats to join the minority government coalition since Solberg first formed it in 2013, thinks voters see that the party’s policies often have prevailed in important issues through its government cooperation. What’s more critical for Hareide is that both of his two deputy leaders agree with Sanner, not him. “KrF is a non-socialist party,” Kjell Ingolf Ropstad maintained in newspaper Aftenposten on Thursday, even after a week of mulling over Hareide’s proposal. “We have had five years of good cooperation (with Solberg’s government). We have had prevailed on many issues.” He doesn’t think KrF’s followers see any need for a change of government. Olaug Bollestad, Ropstad’s co-deputy leader agrees, and both want to finally accept Solberg’s standing invitation to join her government. Hareide has strongly opposed that, claiming the Christian Democrats can’t sit in a government with Norway’s most right-wing party, the Progress Party. Ropstad disagrees, saying that none of Progress’ current government ministers “are too demanding” for the Christian Democrats. Those who upset the party most, Sylvi Listhaug and Per Sandberg, are gone, forced to resign for various reasons (in Listhaug’s case, when the Christian Democrats confirmed they would join a no-confidence vote in the goverment because of Listhaug’s provocations). Most importantly for Ropstad is that joining Solberg’s government would give the non-socialist bloc a majority in Parliament. Joining the Labour and Center parties, which is what Hareide wants to do, would result in another minority coalition that would be at the mercy of the Socialist Left party (SV). “We may win on some issues with Labour and Center, only to lose against SV,” Ropstad noted. The Christian Democrats’ youth organization, also wants the party to join Solberg’s government, while some other party members are so upset by Hareide’s proposal that they’re already calling for his resignation. They include some loyal supporters like Inge Halstensen, chairman of the powerful fishing boat owners federation, and shipowner Per Sævik. “I have belonged to KrF all along, it’s almost been like a marriage,” Sævik, who also has served as mayor of Herøy on Norway’s West Coast, told newspaper Dagens Næringsliv (DN), “but now Hareide is testing my tolerance for pain.” He is confident the party’s grassroots want to keep Solberg as prime minister. Some think Hareide has been too strongly influenced by advisers who want to shake things up. The Labour Party’s youth group AUF, meanwhile, is also skeptical towards cooperating with the Christian Democrats, and made it clear they’ll fight any concessions regarding expansion of Norway’s liberal abortion and gay marriage laws. Several commentators and party members like Sævik also don’t think Hareide should continue as leader if the vote at the extraordinary meeting in November goes against him. Still others are calling Hareide “the little manipulator” who’s devaluing his party’s own achievements and contributions to the current government. While Hareide has bemoaned his party’s loss of voters, he is now being accused of abandoning those voters who’ve stuck with the party. 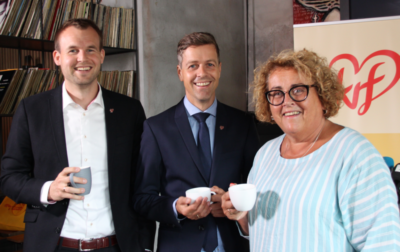 He does have some support within the party, for example from Geir Jørgen Bekkevold, a Member of Parliament and pastor who recently raised a fuss himself when he performed a controversial wedding ceremony for a lesbian couple. Bekkevold calls any government cooperation with the Progress Party “impossible,” and thinks the party will attract more voters by turning left. The Christian Democrats’ party secretary Hilde Frafjord Johnson also seems enthusiastic about teaming with Labour, while others are heartened by Labour leader Jonas Gahr Støre’s own stated Christian beliefs. Kjell Magne Bondevik, a former prime minister for the Christian Democrats, also supports Hareide and apparently thinks cooperation with Labour is worth a try. There’s a lot to be resolved within the Christian Democrats before a vote is taken next month, if the struggling party doesn’t implode in the process. Hareide is keen to follow his call, and has claimed he’ll stay on as leader no matter the outcome. That may not be up for him to decide.